Bookride: Gerald Kersh. 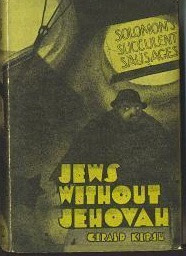 Jews Without Jehovah, 1934. Gerald Kersh. JEWS WITHOUT JEHOVAH. Wishart & Co., London, 1934. 10 autographed letters, 26 typed signed letters and 1 telegram, with envelopes, 1000 words plus in toto, 1946 - 1965, London, Mexico, West Indies, and Canada, all to an infatuated female admirer (married). The first 11 letters unfold heated postal flirtation, with Kersh’s sometimes hesitant priapism occasionally bursting free: “Just received the lock (sic) of girdle of chastity - just you wait”; “Naturally you’re frustrated my lamb! Is such an elegantly - organised concatenation of flesh, blood, nerves and sensibilities made to caress itself in day - dreams”; “We’ll probably meet soon and make love to each other, or something” etc, etc. Despite the primary carnal thrust of these letters, Kersh manages to discuss a number of other matters less at the forefront of his mind - a tussle with an octopus off Barbados, the sending of bogus billets - doux on dirty postcards to the editor of “The People”, who had published unflattering photos of him; his work in progress, problems with the taxman, etc. The final letter, 15 years later, has a more formal tone, although a carbon - copy of a long adulatory letter by his admirer makes clear she remains available. I've purchased 1 copy of Battle of the Singing Men on ABE since 2000, and seen one other. Selected Stories has been offered at least once - I bought it - it has white cardboard covers, not a hardcover. I've bought 3 or 4 copies of Private Life of a Private on Ebay and seen another, some sold as by Kersh and some not. I've bought 3 Michael Joseph editions of Night and the City on ABE, one a first, one a reprint, and one of which was lost in the mail. I've seen 2 copies of the Michael Joseph edition of Men Are So Ardent on ABE, one of which had a damaged dust jacket. I've seen 3 copies of the Michael Joseph edition of I Got References on ABE - I bought the one with the dust jacket. It's hard to get a record of what has appeared on ABE because sometimes items sell very quickly. And, by the way, I actually own copies of every single Kersh title - I may be the first on my block. My husband is Gerald's nephew and I have been trying to track down a copy of JWJ for the past twenty years with no luck so far! I am currently collecting as many of Gerald's books as I can for our children. My husband has a massive collection but I would like the children to have their own copies. It is amazing how many turn up in charity shops and jumble sales in the UK - even pretty rare copies. We have spoken to many family members who remember the fallout in the family caused by JWJ. When we hear the tales of how aunts,uncles and cousins destroyed their copies it is truly heartbreaking! I have a xerox copy of the book and would be happy to recopy at cost. Contact me at blindlemmingchiffon@earthlink.net. I owned a copy, but sadly, had to sell it a while back. I have a copy which has just come into my bookshop. It has a jacket and is in pretty good condition. Shaun, just to give you an idea of what you have, a copy with the jacket went for auction on eBay a few years back for around $4,000 US. I sold mine, which was in about good condition and had a xerox jacket, for about $2,000 US. I would love to know who Anonymous is - Gerald Kersh was my father's cousin. The libel suit was brought by my grandmother, Anne Miller. I have a huge collection of Gerald Kersh's books with my children in mind too, though not a copy of Jews Without Jehovah. I know my uncle had a copy but he has passed away now. It would be good to make contact - we are clearly related. My son is an artist and was very taken with Gerald's looks. As a teenager he painted a portrait of Gerald Kersh based on the photograph on a dust jacket. It's probably still in our loft. I visited the collection of Gerald Kersh material in the Gotlieb Center at Boston University in October, 2016. They have 21 boxes of material, but I only had time to examine one box (#2). This happened to include a lot of material by his widow, Flossie (Florence Sochis, born Philadelphia(? ), 1911). This included a 1954 letter describing Kersh's acrimonious divorce from Lee Kersh, and a great many items documenting the sad, impoverished years following GK's death--- letters to social agencies, angry correspondence with landlords, etc. I left transcriptions of some of this material with the Gotlieb center staff. of a dilapidated restaurant. He claimed in former times to have had a household of numerous wives--- one of his guiding principles was "sell, never trade." The emphasis was on the women who continued to be fascinated with the man, including an unnamed famous French actress.